How to add Sidebar to my page/post? On the next image and in your dashboard you can see new menu item called “Appearance-> Menus”. This is where you can organize and setup your menus. 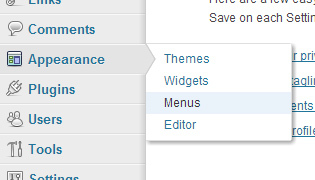 In this sections you can easily create and manage your menus by simple “drag and drop”. 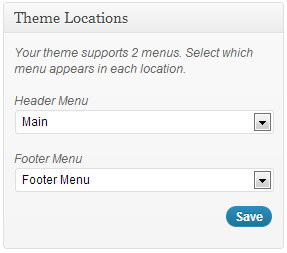 You can create as many menus as you need, as for the header area, footer and i.e. for the “Custom Menu” widget. The modules, such as Posts, can be expanded, or collapsed, by clicking on the module title bar. In addition, those modules can be moved by hovering the mouse cursor over the module title bar, when the mouse cursor changes to 4-arrows, hold the left-mouse button down, drag the module to where you want to place it, then release the mouse button (this is called drag-and-drop). To create a new menu navigate to Dashboard -> Appearance -> Menus. You will want to type out a name for your menu in the “Menu Name” field as see in the image to the right and then click the “Create Menu” button. After creating your menus they will be added as tabs that you can choose between as seen in the second image. Now when your menu is created you need to add items to it. On the left side you can see metaboxes with your pages, post, etc. Simply check which page you wish to display and then click on “Add to Menu” as seen in the image below. Once you have some links on your menu you can click and drag them around however you wish to order them. 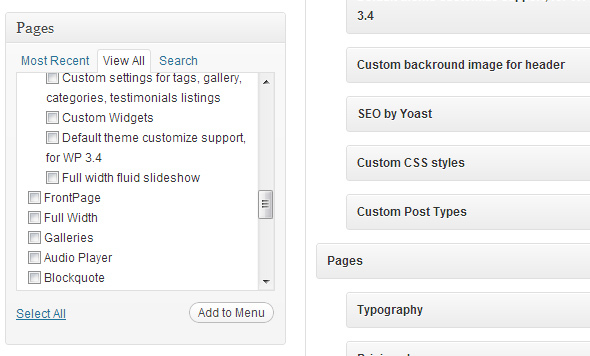 It is also possible to add custom links, posts, tags and other types of links to your menu also. By default they may not display so look to the top right corner of your screen and click on the “Screen Options” button to enable them. To make drop down menu, you need to move your menu items as it shown on the image below, to make hierarchy. Simply drag and drop your menu items: hover mouse over the menu item, hold left-mouse button down, drag menu item to where you want to place it, then release the mouse button. After you are done creating your menu you will need to choose a place to display it. In the top left corner you will see the areas where you can display your menu: Header Menu & Footer Menu. 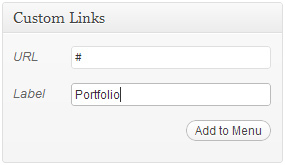 Using Custom Link metabox you can create menu items with custom links or even without any links. To disable one of the menu links (make it non clickable), you will need to create a “Custom Link” and set the URL to a “#” character. You can also use your menus with the “Custom Menu” widget. This is useful for creating navigation menus for other areas such as the footer or sidebar. Navigate to Dashboard -> Appearance -> Widgets and you can drag the custom menu widget over to one of your sidebars and then select one of your menus in the widget as seen in the image.